so many times i end the day feeling so emotionally defeated, exhausted, and anxious about my struggles and shortcomings. my mind spends literally every waking moment analyzing the what and what if’s of the past, present, and future. today is one of those days, and my mind is running clips of this past weekend (mostly the stressful ones) over and over again. but intertwined with today’s thoughts is the fact that it’s easter. he died on the cross for my sins, resurrected on the third day, conquered sin and death, and i am saved. because he is risen, indeed, and that’s all my soul needs today. 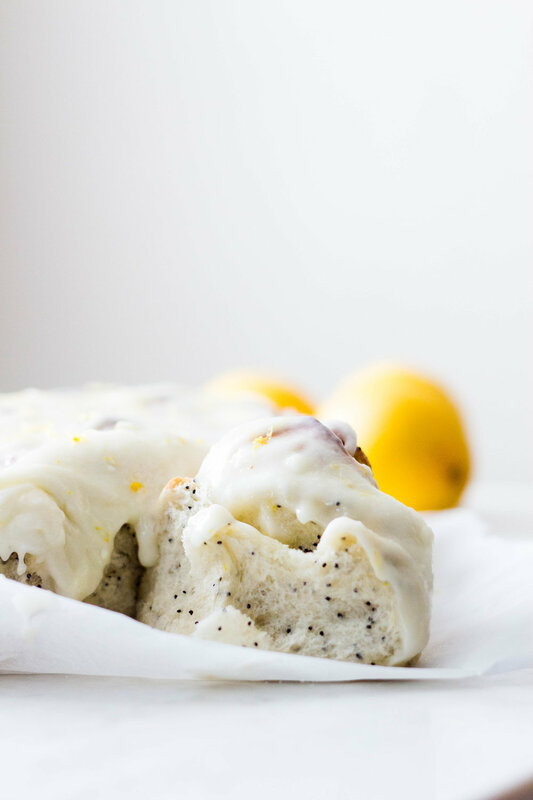 these lemon poppy seed buns were from the same lemon pickings as these lemon bars, straight from my parents' garden. the buns and the filling aren't too sweet, but i think that's more suitable for my palette, since the cream cheese frosting is already sweet. 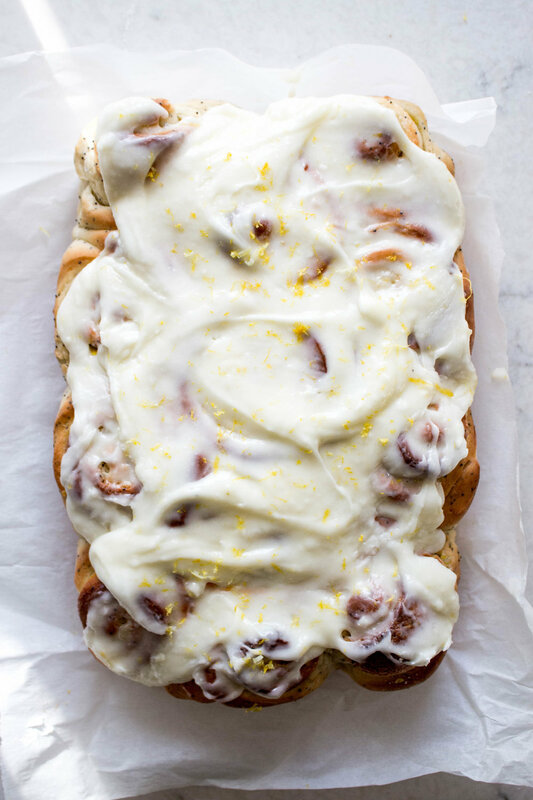 the buns are quite soft and pillowy with the right amount of citrus flavor to pair with the tangy cream cheese frosting. 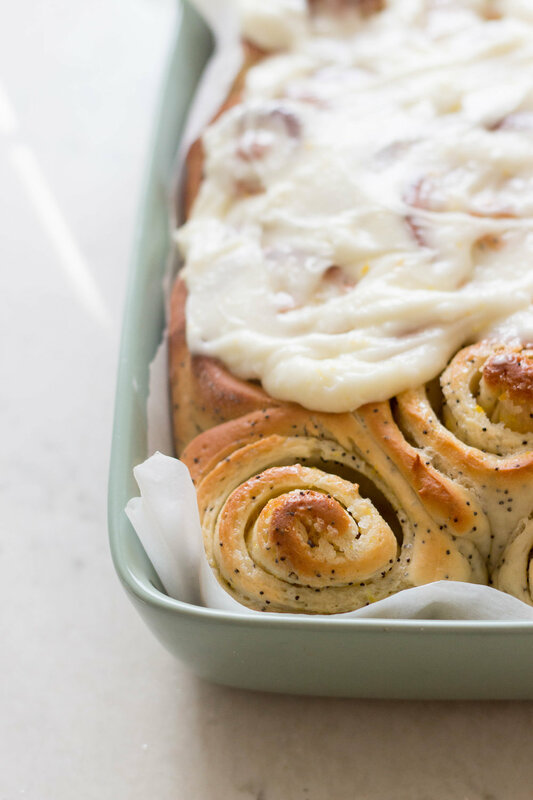 it's a nice break from your traditional cinnamon roll, and though delicious, i don't think these could ever replace that household classic. bakers' notes: the dough was pretty sticky for me, so i've increased the flour amount in the recipe below. if your dough is still sticky, add flour a tablespoon at a time until it's still slightly tacky. variations: I like more lemon flavor, so feel free to adjust the zest in the filling- you can even add some in the buns! i'd imagine these would work well with other citrus combos also- orange, cara cara, etc! make the buns: in a medium bowl, microwave the milk and sugar for 45 seconds, until warm but not hot. stir in the yeast, and allow the mixture to sit for five minutes, or until the yeast is foamy or puffy on top. stir in the melted butter, oil, eggs, vanilla extract, and salt. pour the mixture into a large bowl (or the bowl of a standing mixer, if that's your workflow). slowly add the flour a cup at a time until a sticky dough forms. add the poppy seeds, and let the dough knead for 5 minutes (more if you're doing it by hand). the dough will be slightly tacky, but still firm enough to shape into a ball. make the filling: in a small bowl, rub the sugar and lemon zest with your fingers until the sugar is moistened. set aside. assemble the buns: line an 8x8-inch pan (i used a 9x11-inch pan) with parchment paper, and set aside. when the dough has doubled in size, turn it out onto a large, well-floured work surface. roll out the dough into a 10-inch by 14-inch rectangle. Spread the softened butter over the dough, coating it evenly. sprinkle the sugar and lemon zest mixture over the butter, making sure the filling goes to the edges. from the long side, roll the dough tightly into a log, pressing down slightly as you go. with a sharp knife, cut the dough into ¾-inch buns. 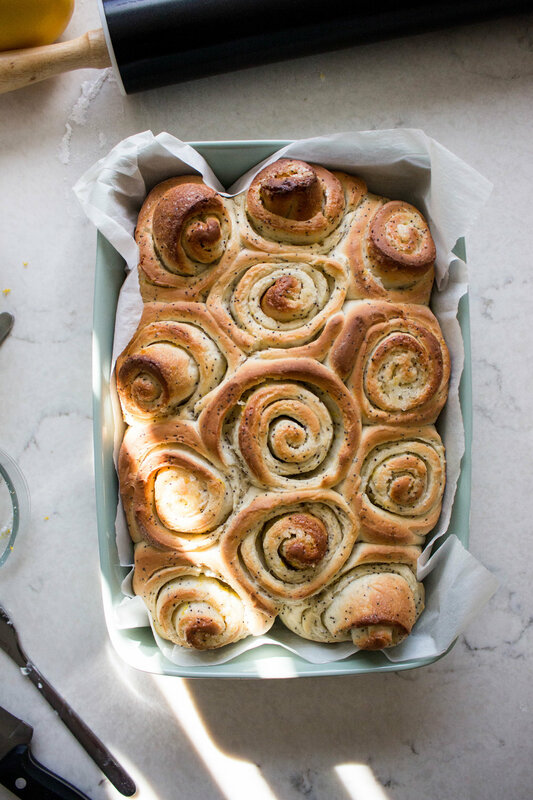 arrange buns into your parchment paper-lined pan. 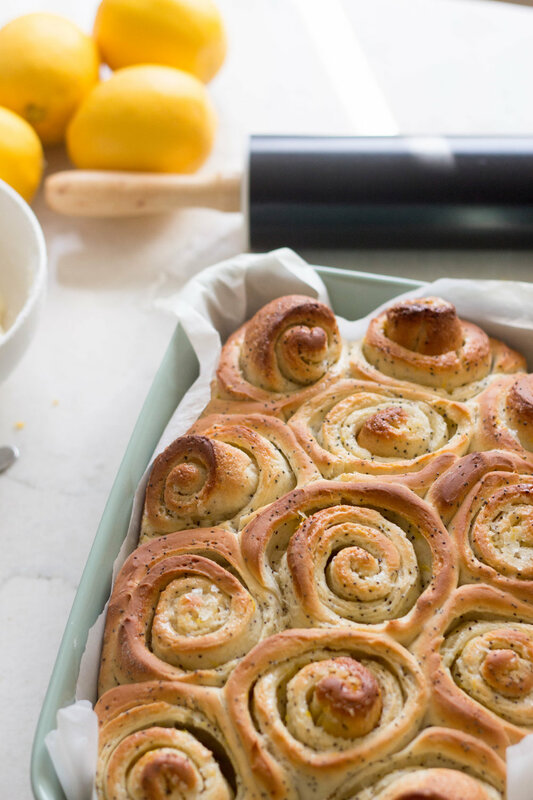 you can bake leftover buns in ramekins (make sure they're lined or greased!). cover the pan with plastic wrap or a cloth again for a second rise. Let it rest in a warm place for 45 minutes. preheat the oven to 375 f. bake the buns for about 30 minutes, until the top of the buns are a deep golden color. make the frosting: mix all the frosting ingredients together. 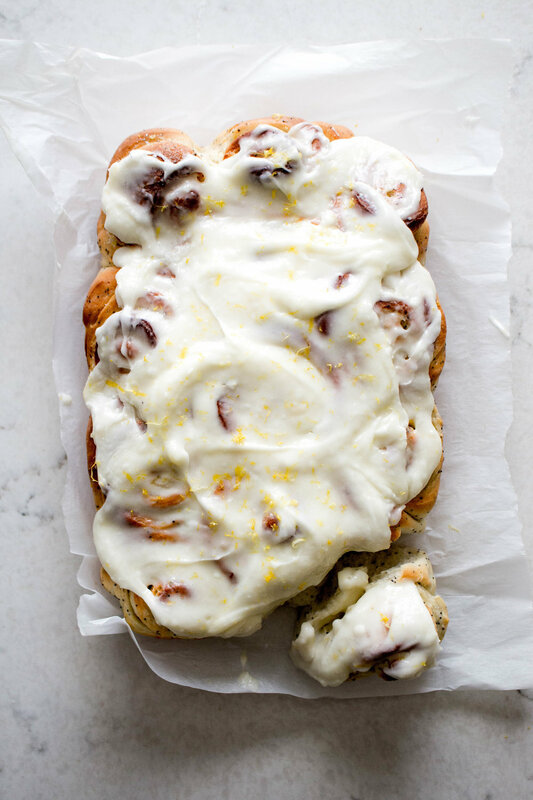 let the buns cool slightly (about 10-15 minutes), then slather on the cream cheese frosting. serve warm!! !